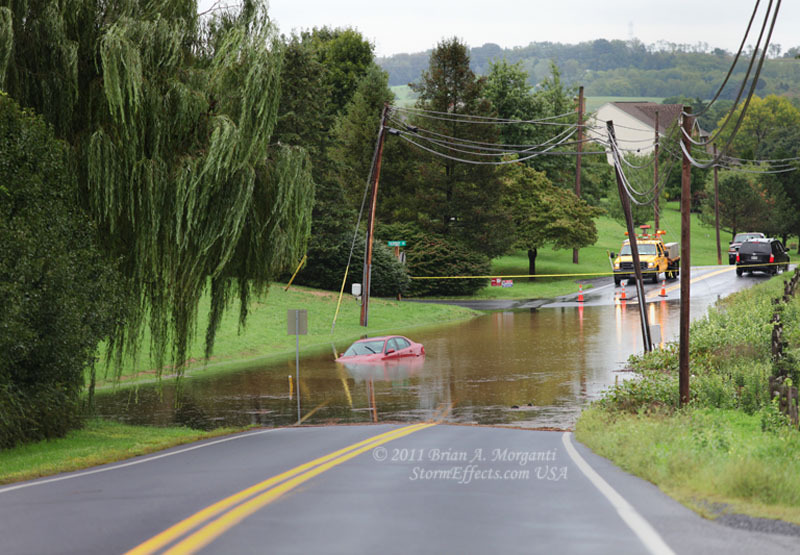 The remnants of Tropical Storm Lee began to bring rainfall into Pennsylvania as early as Sunday, September 4th when thunderstorms dumped nearly an inch of rain ahead of a stalled frontal boundary. 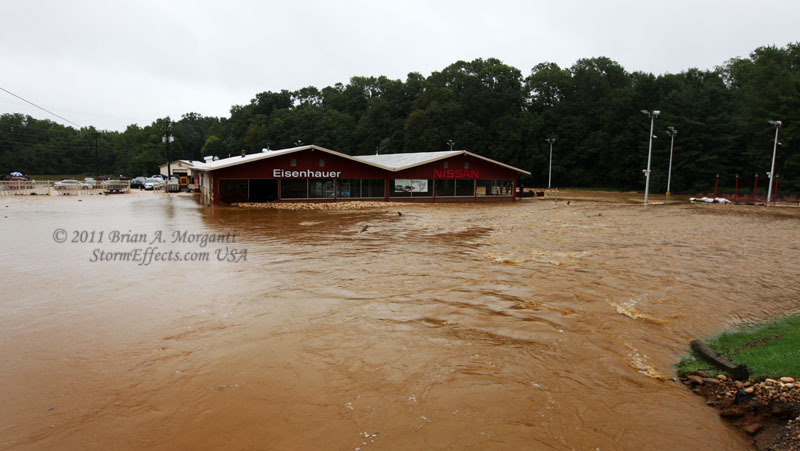 Rich moisture was streaming northward from the gulf coast states and this pattern would continue for the next several days. 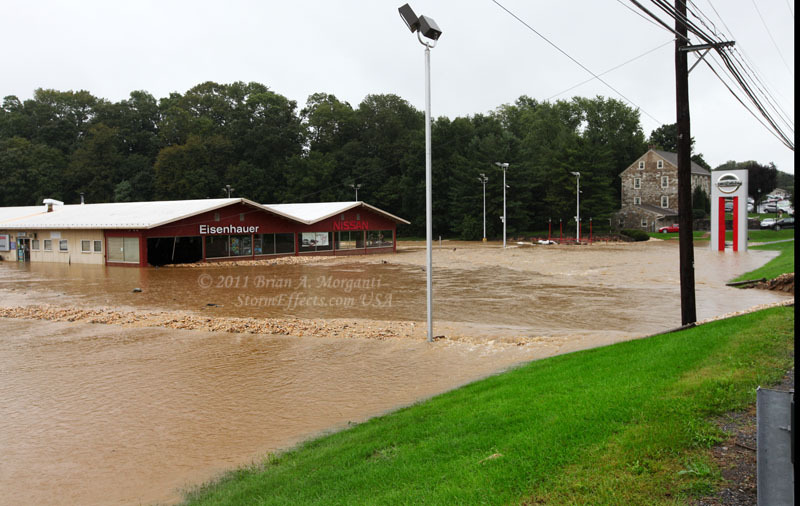 The ground was already saturated from Hurricane Irene that had just dumped in excess of 4" of rainfall a week earlier. 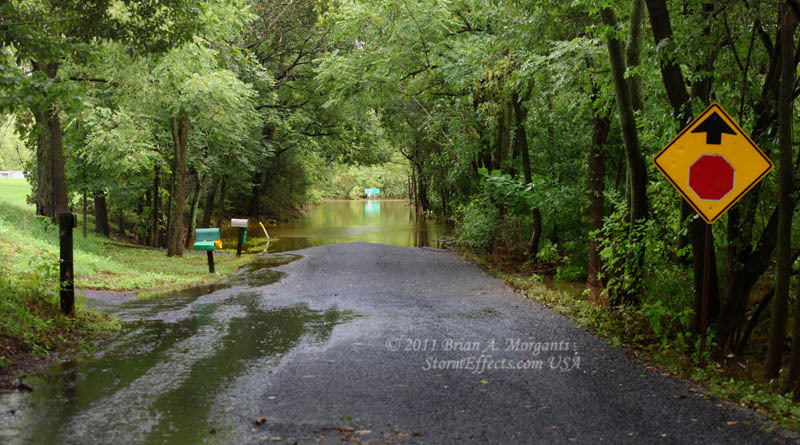 Between Sunday, September 4th and Thursday September 8th I recorded 11.18" of rainfall for my location here in western Berks County. 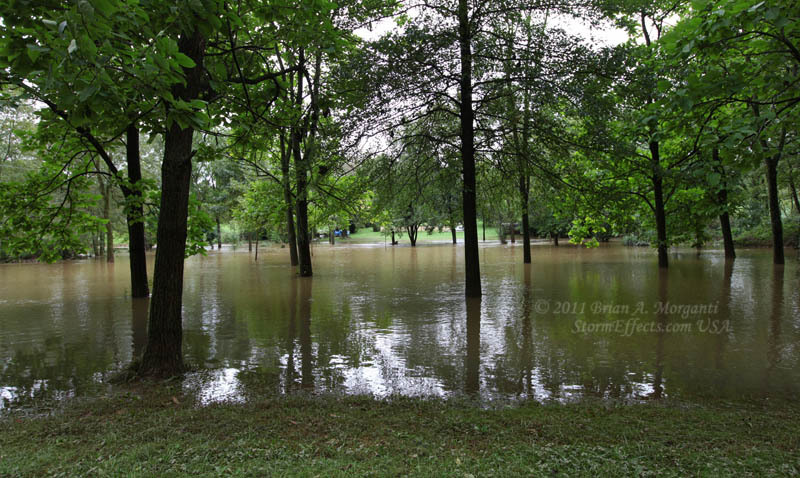 The stream and river flooding created by this event rivaled those set in 2006 and 1972, the later being the historic flooding caused by Tropical Storm Agnes. 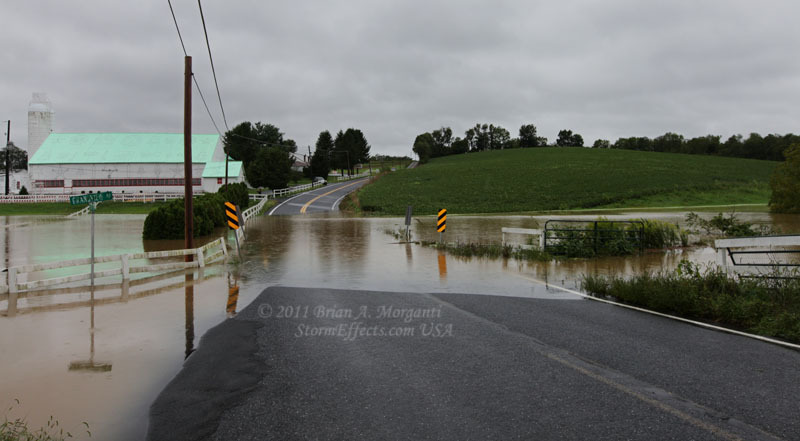 The following photographs were all taken in western Berks County within a 15 mile radius of my home. 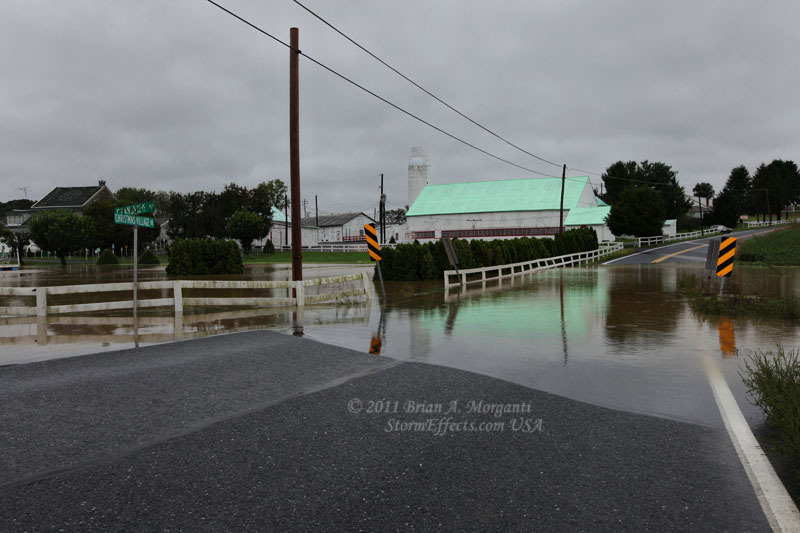 The first three images below were taken at the famous "Christmas Village" farm along Christmas Village Road. 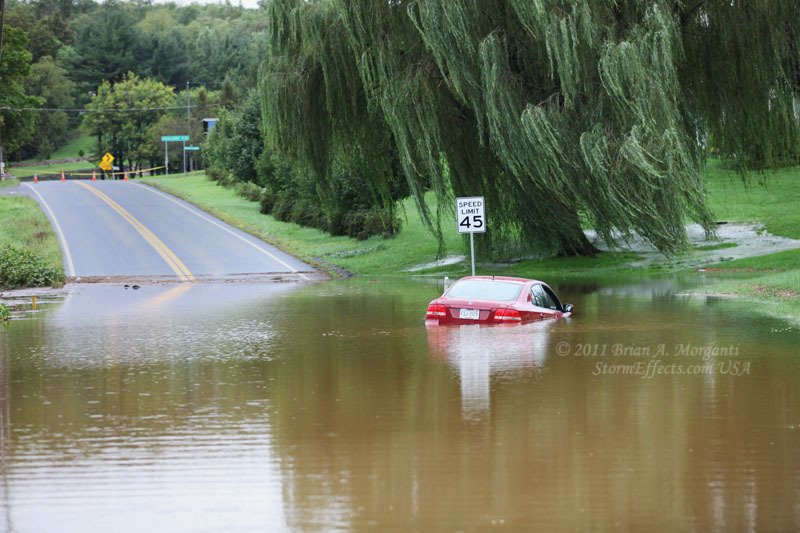 The scene below was repeated many times over throughout the area as motorists misjudged the depth of the water and soon found themselves helplessly afloat. 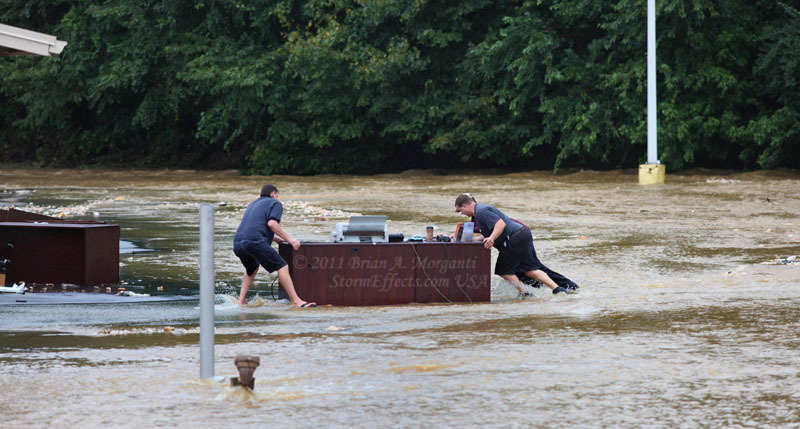 A local tow truck operator was kept busy all day retrieving these semi-submersed vehicles which he referred to as "submarines". 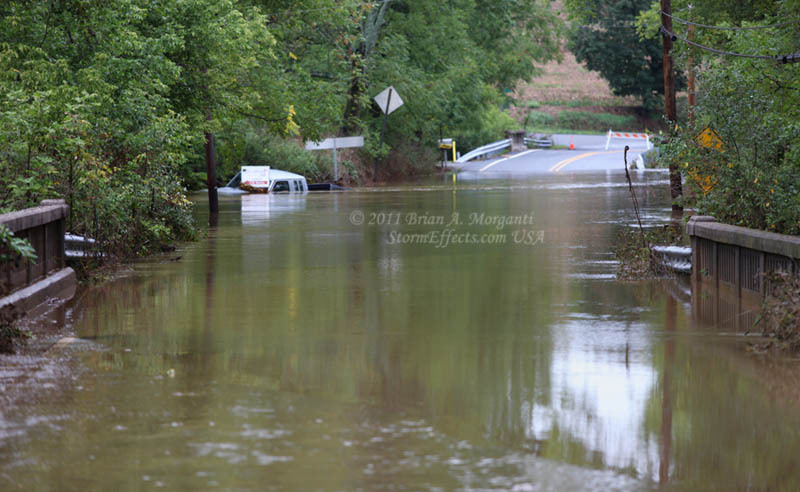 The two image below were captured along the Bernville to Robesonia road near highway 183. 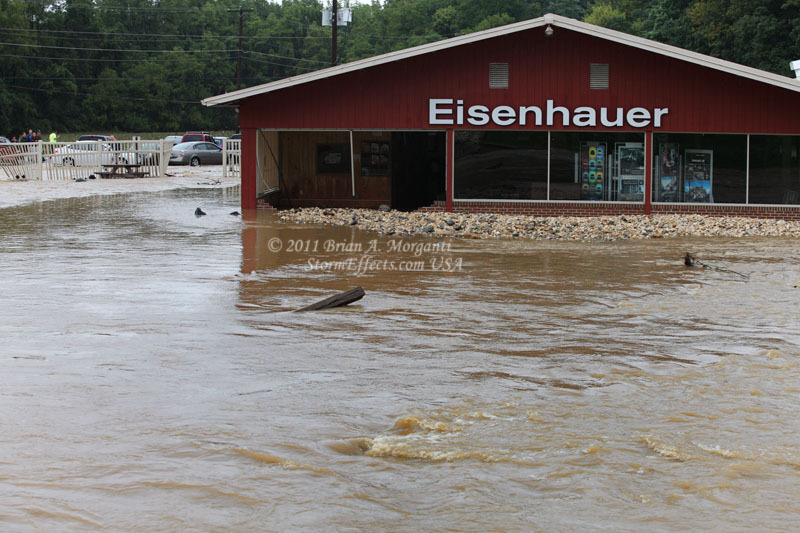 The following series of images were taken at the Eisenhauer Nissan dealership located along route 422 in Wernersville, PA. A small stream that normally flows peacefully within its banks immediately in front of the dealership building turned into a raging river on this day. 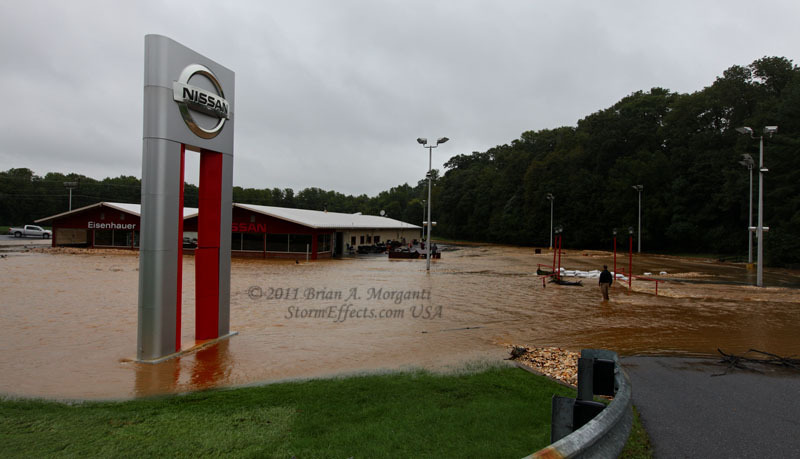 Luckily the inventory of new vehicles were safely moved to another lot prior to the flooding, but there was not enough time to relocate some vehicles that were in for service. 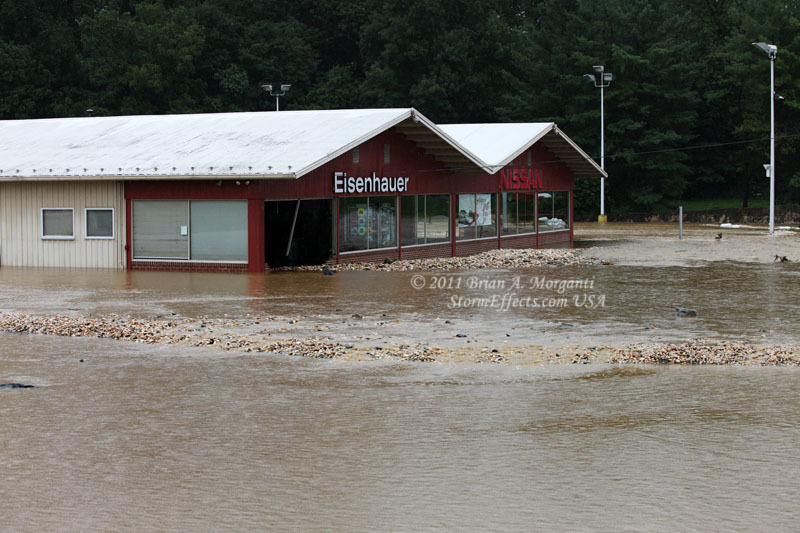 This would not have been a good day to pick up your new car! 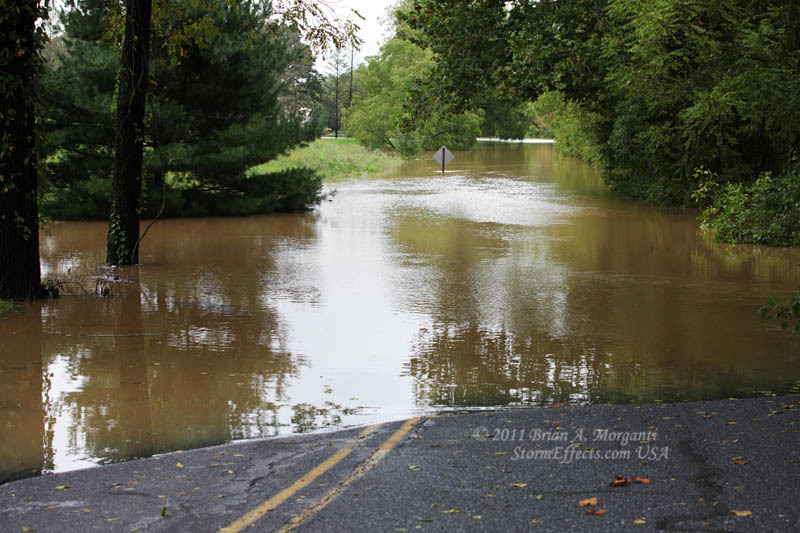 Getting to your destination was at best extremely difficult and in many cases impossible. 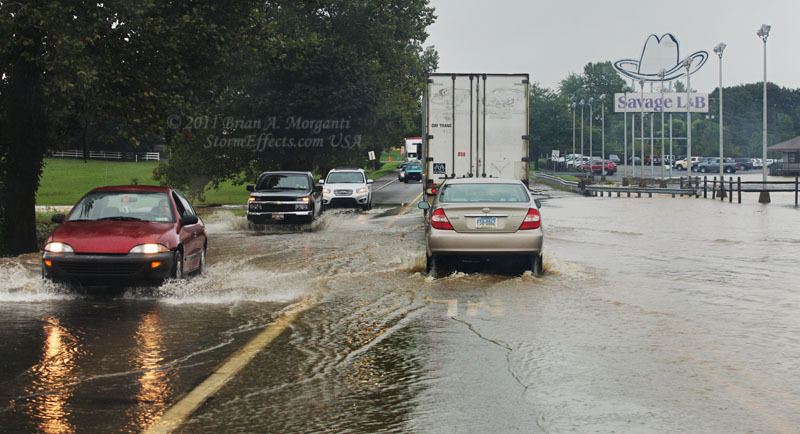 The below left image was taken along route 422 in Robesonia while heading south and was typical of minor to moderate street flooding. 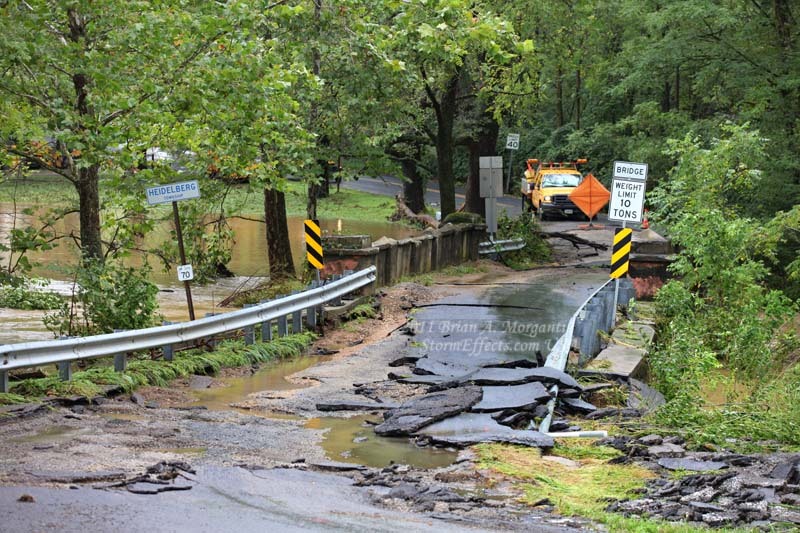 The second image was taken about two hours after a rural county road was nearly washed away by the raging waters that overwhelmed the bridge crossing. 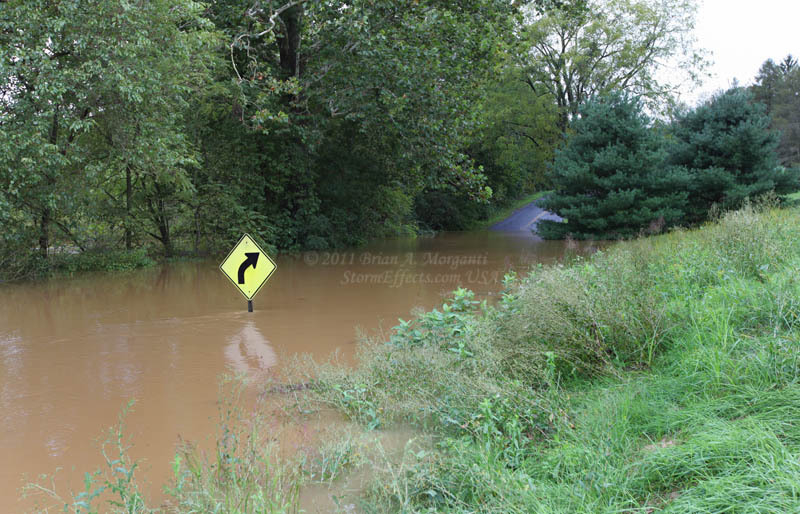 All too often the road ended abruptly as the numerous small streams in the county overflowed their banks and created a small lake across the road, sometimes to the depth of several feet! 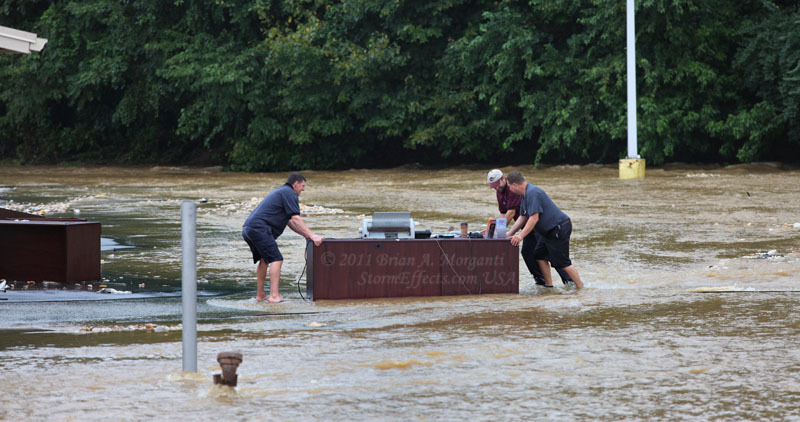 Still, some folks "tested" the waters...and lost, as shown by the pickup truck in the last image below. 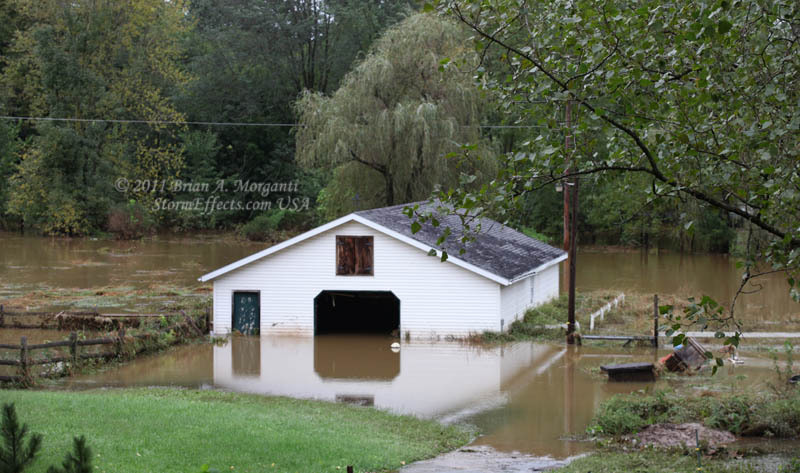 In some case the flood waters harmlessly covered a pasture or a grove of trees, but in other cases homes or other buildings were inundated by the waters. 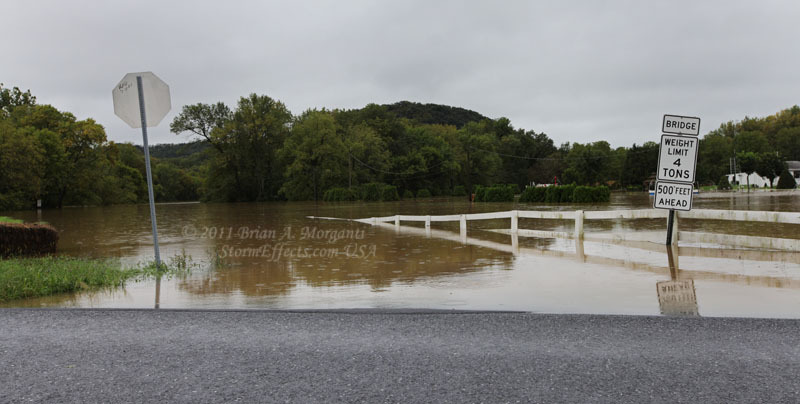 Flooding was much more severe near some of the big rivers in Pennsylvania such as the Susquehanna and the Schuylkill, but with all the road closures I opted to stay closer to home during this event.